Why do I shoot in Infrared? A big issue with me and my hobbies is keeping my attention piqued. I am the type of person who will dive head first into something, wrap my brain around it, and go all in only to become bored and move on. The problem is that there are often lulls as the tide of hobbies ebbs and flows. It’s in those lulls that seemingly nothing can interest me. One of the fortunate beauties of photography is that it is a hobby that continues giving. The moment you have mastered the basics is the moment you hear about long exposure photography or shallow DOF portraits and begin learning once again. Infrared photography is another such facet. I will make a note here and say that I am only going to talk about my analog experience shooting B/W IR film in this post. I’ll most likely make another for my foray into digital IR. Also, I have managed to shoot a roll of Kodak Aerochrome but will wait until I shoot my last two rolls before talking about my experiences (and frustrations) with that. For me, it all started when I came across a few photos with very unique and foreign aesthetic. The cliché dark sky with the ultra bright foliage of infrared photography is sublimely wonderful. I was immediately hooked and wanted to know how the photographer was able to capture such otherworldly contrasts and tones. Embarking down that yellow brick road of adventure lead to spending $40 on a 62 mm ø threaded R72 (Wratten 89B) filter that I could adapt to my (new to me at the time) Bronica ETRS and EOS 35mm cameras. Being 16 or 17 years old that $40 was not very inexpensive and neither was the $10/roll for Rollei IR400 film. Being still in high school I used the campus and the streets around my house for the initial test shots as I learned how to expose the unique film to the finicky and invisible IR light. I blasted through a roll of 35mm film bracketing each frame and eventually landing on a working ISO of 6 with the filter on. Immediately I was blown away by how I was now able to achieve that distinctive aesthetic myself! In the process I also learned that the film not only was IR sensitive but had a beautiful grain to it. I was able to print with it in the darkroom and made some very fantastic prints. My biggest achievement in that experience was taking the one roll of 120 size IR film I ordered and shooting with the 1940s era 2x3 Graflex I had excavated from the bowels of the photo room. That season a rare snow had fallen in my hometown the time of my infrared frenzy. When I say rare I mean it, my childhood house is around sea level in elevation with a winter average of 55˚f. So when it snows (and sticks) it is an occasion to behold, and ditch school too. Spring Foliage at Principia College. Spring 2012. 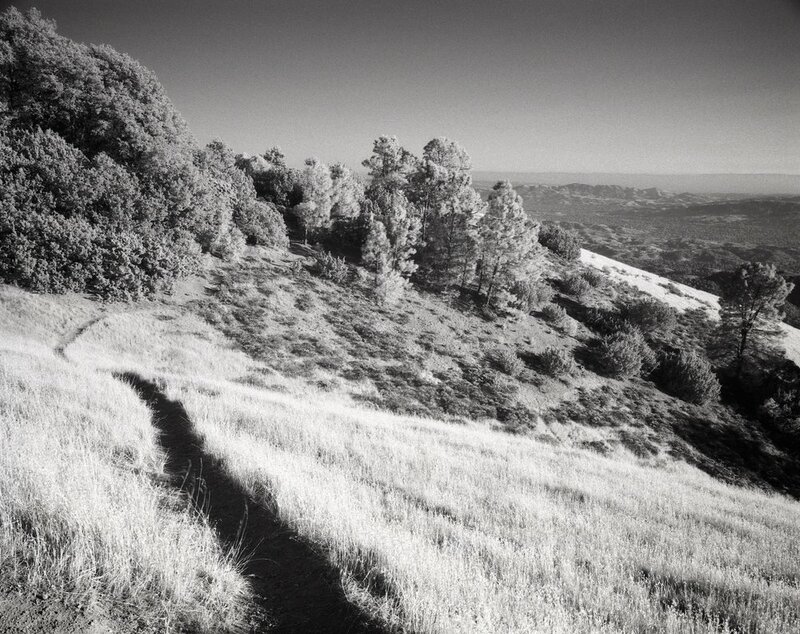 I trekked the old Graflex to the base of Mt Diablo, metered with my digital camera, and held the IR filter of the old 105 mm lens. Exposing eight frames at 6x9 I finished the roll quickly. That day the storm that had dusted snow on the mountain was departing, leaving behind a dramatic cloudscape in its wake. The best shot on the roll captures my favorite vista in a timeless and contrasting fashion with an added bonus of several other hikers in the distance providing a sense of scale. As with all of my hobbies the tide of attention with infrared photography ebbed away. I didn’t pursue much of it again until my freshman year of college. Having finally garnered access to the campus darkroom I ended up ordering a few rolls of 35mm Rollei IR again to take advantage of the extreme green of an Illinois spring. While I was not head over heels as when I had first discovered the hidden treasures of infrared imaging I was excited nonetheless. By this point I had upgraded to a Cokin P-series square filter contraption and had the special Cokin IR slide in filter. This was great because all my lenses across all my cameras now had an IR filter. I took out my oldest 35mm Canon EOS with the 17-40L and journeyed into the forests around the campus. Everything was so green and the developed negatives certainly showed their vibrant brightness. From then I didn’t dabble in infrared until I had graduated and moved back to California. I played with a few rolls of Ilford’s IR offering, the not too expensive and easily available SFX200, which yielded some decent results. Then again this past summer I played with some Rollei film as well, taking a couple 120 rolls along the coast and to the beach. I even managed to snap a few nice photos. The allure of the surreal and alien is what entices me about working with infrared. It is unique in that a scene I’ve visited many times can become entirely fresh a new. Like running into an old friend from years past who is now older; you recognize their face and features immediately yet they are not the same as your memory. Infrared photography is a breath of fresh air when the world of the mundane becomes overburdened. That is why I love it so much, simply put it is a nostalgia of looking forward and finding something new where you’ve previous looked before.